At first we were horrified by the idea of a Mr. Peabody & Sherman movie. The WABAC machine had been modernized, Mr. Peabody's lab had been completely redone, and we were not ready. But then we saw the first half of the movie and simply fell in love with the classic duo all over again. 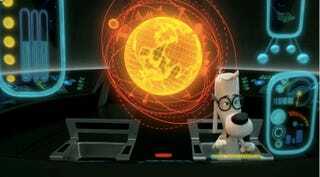 Check out the very first Mr. Peabody & Sherman trailer with actual footage from the film. Trust us, this movie lobs some serious issues at Mr. Peabody about parenthood and raising a child while maintaining the essence of wonder and playfulness we adored from the original.